Healthy Digestion is something both humans and our furry friends need in order to live a long and prosperous life! Pumpkin can help regulate your dog’s digestive system and help ease constipation by adding more fiber and softening your dog’s stool. However it can also be an additive if your little one has super soft stool (diarrhea) by absorbing extra water content and firming it. Pumpkin is also known to assist in Weight Loss. 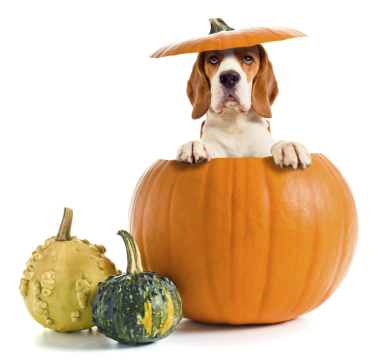 If your pet needs to lose a few pounds, try adding some pumpkin to their meal in addition to reducing their portion. The added pumpkin not only tastes great but also leaves them feeling full when subtracting some of the main course. Cranberries are known to help humans with urinary symptoms the same goes for pumpkin and your dog. Pumpkin seeds are high in essential fatty acids and antioxidants (good for overall healthy skin and fur). The oils in pumpkins’ flesh and seeds are believed to support urinary health. They are also an excellent source of Vitamin A, beta-carotene, potassium and iron, and may even reduce the likelihood your pet will develop cancer. Pumpkins were once recommended for removing freckles and curing snakebites! The name "pumpkin" originated from "pepon", the Greek word for "large melon"